This is my stack of hexie flowers. Exactly half (28) now have the ring of blue hexies around them, so there are only 28 left to go. Slow and steady wins the race, right? Here they are laid out on my design 'wall', aka my living room floor. It's like having the frame of a jigsaw puzzle finished...now I just have to fill in the middle. I'm not sure I like having the top and bottom right corner flowers. They seem a little out of place, like the design would flow better if the left and right corners were symmetrical. I'll have to see how I feel about it when the inside is filled in. I assembled this flower wrong. It's one of the pieced hexie flowers I made after winning Mickey's DePre's book from Quiltmaker magazine, which you can read about here. I should have made it with the pink stripe on the outside so the flower wouldn't blend into the blue background hexies so much. Last night I debated whether or not I'm unhappy enough with it to take it all apart and put it back together. Now, after looking at the layout picture and thinking I might remove two flowers, this would be one I'd remove. I'd probably remove the blue background hexies and stitch the flower to the back of the quilt or something. It is pretty, it just blends in too much. The picture of this flower is my first ever edited picture on the blog. Okay, so all I actually did was crop it on Picmonkey, but at least I have now actually used Picmonkey for something! And it was so simple and painless I'm pretty sure I'll do it again. I love those pieced flowers. The add great variety to your quilt. I actually like the effect that the flower with the pink stripe gives and think it looks really well as it is. It adds a lovely variation to the arrangment, almost like a little pinwheel flower. I do agree that at the moment it looks like a more symettrical arrangement might flow more, but I think once you have all the flowers filled in it will look great with the current arrangment. I think you are wise to wait until the quilt is filled in before deciding about symmetry. I usually lean towards the more symmetrical, but that isn't always what I decide when looking at everything all together. That's a lot of piecing! Lovely colours! Gosh, that's a lot of work!!!! They ALL look lovely. I agree, make no decisions until it's all ready. Very pretty...but far too time-consuming for me! Wow, you are very patient! It is so big!!! i am amzed by your precision!!! I wish I had your patience. 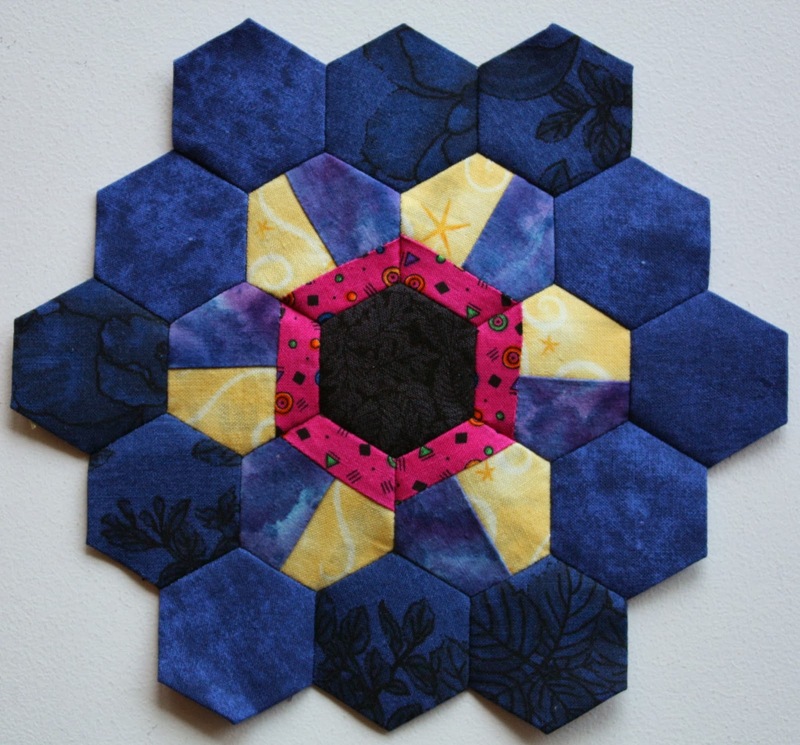 What a lovely hexa flowers!Love to see the finished quilt! oh my gosh- WOW! your hexies are gorgeous, and I can only imagine the patience you must have to take this on. I love picmonkey. But I love your hexie flowers much more--beautiful! Your hexie flowers are beautiful. I have never tried EPP but after seeing yours I am inspired. It's looking good so far. I love using PicMonkey, there's so much you can do in it. That's going to be so pretty when it's done!